LOS ANGELES, Nov. 18, 2015 /PRNewswire/ -- Hyundai today reveals its all-new 2017 Elantra at the Los Angeles Auto Show. As one of Hyundai's all time best-selling models, the new Elantra enters its sixth-generation building on the momentum and success of its proven award-winning formula and strong value proposition by offering a bold aerodynamic design with sophisticated styling, all-new efficient powertrains for enhanced fuel economy, better ride quality and noise insulation, and comprehensive safety with class-above features. Assembled in both Montgomery, Alabama and Ulsan, South Korea, the new Elantra distinguishes itself from the compact car class with the addition of segment-first premium convenience and safety technologies, and is expected to receive a Top Safety Pick+ rating from the Insurance Institute for Highway Safety (IIHS) and a 5-Star Safety Rating from the National Highway Traffic Safety Administration (NHTSA). 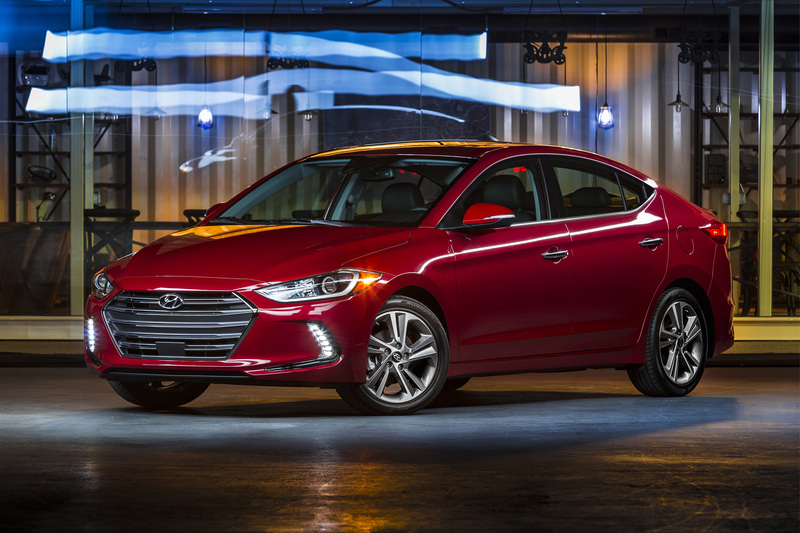 The 2017 Elantra will arrive at Hyundai dealers in January. The new Elantra projects confidence with sculpted body forms complemented by smoothly contoured lines that reveal the underlying inspiration of Hyundai designers. Inspired by the concept of dynamic precision, Elantra's architecture was a perfect platform for collaboration between Hyundai designers and engineers to blend advanced styling with functional aerodynamics. From the front, the new Elantra is defined by Hyundai's signature hexagonal grille that projects a distinctive character when combined with its modern lighting signatures, including available HID headlights with Dynamic Bending Lights and unique vertical LED daytime running lights, which are firsts for Elantra. Elantra's sporty lower front fascia integrates functional front wheel air curtains, a component that is derived from the Sonata Hybrid that helps manage air flow from the front of the vehicle and around the wheels to minimize turbulence and wind resistance. In addition, underbody covers, an aerodynamic rear bumper bottom spoiler and rear decklid designed with an expanded trunk edge contribute to Elantra's 0.27 coefficient of drag. Elantra features a sleek bodyside character line that accentuates a sweeping side window silhouette and striking side profile. Available premium features such as 17-inch alloy wheels, all-new LED door handle approach lights, side mirror LED turn signal indicators and LED taillights with high tech graphics add a level of sophistication and detail to this class-above compact sedan. 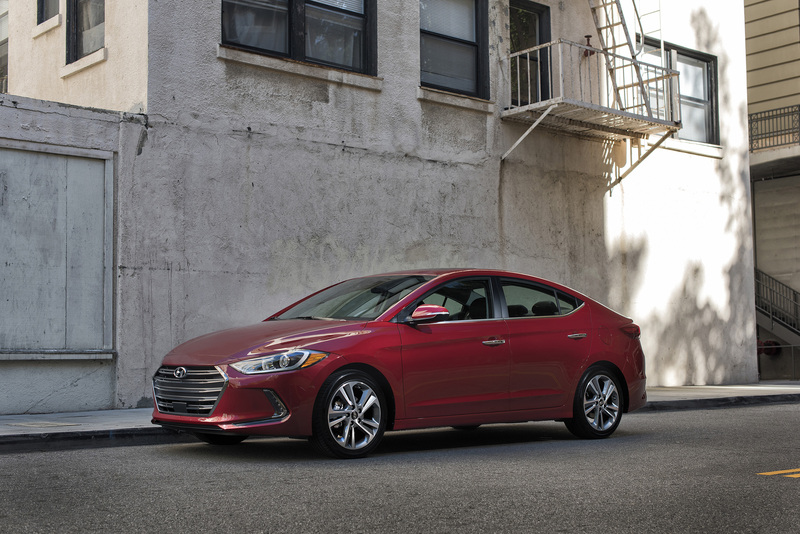 The 2017 Elantra will be offered in eight exterior colors, five of which are new to the model. Elantra's overall length has increased by just under an inch and its proportions are further enhanced by increasing its width by 1.0-inches, presenting a more athletic stance and stable appearance. On the inside, Elantra continues to depict a modern driver-oriented design that is optimized for intuitive control, improved interior roominess, high-quality materials and premium technology features. The contemporary interior design integrates premium soft-touch materials in key touch points and high-tech details to create an inviting and comfortable interior environment for all passengers. The wide design of the instrument panel provides a feeling of spaciousness and is available with a 4.2-inch color TFT LCD instrument display for improved driver visibility and functionality. The rest of the center stack is laid out in a horizontal design with buttons and controls placed in logical groups by function, and a slight seven degree tilt toward the driver for optimal ergonomics. Available premium convenience features such as a segment-first integrated memory system for the power driver seat and side mirrors, dual automatic temperature control with auto defogging system and auto-dimming rearview mirror further enhance driving comfort, along with advanced ergonomic front seats. The front seats feature high-tension lightweight seat frames for improved performance against collisions, and a multi-firmness seat pad to help reduce driver fatigue over long distances. In fact, all of Elantra's seats, covered in either cloth or available leather, are made of SoyFoam™, an environmentally friendly seating foam that substitutes petroleum based polyol with hydroxyl-functionalized soybean oil and optimizes the formulation/process to maximize mechanical performance. For added comfort and convenience, passengers enjoy available heated front and rear seats with a versatile 60/40 split-folding rear seat. Elantra also offers class-above total interior volume with improved rear headroom and legroom. At 110.2 cu. ft. of total interior volume, the 2017 Elantra is classified as a Midsize car by the EPA, which is a class above Mazda3, Ford Focus and some premium models. In addition to passenger comfort, improving interior cabin noise management and reducing road noise were top development priorities for Hyundai engineers. To reduce engine sound a hood insulator is equipped on the majority of Elantra models. Engineers also reduced the aperture size in the front dash panel by 25 percent, increased the thickness of the front door window glass, and added various sound absorption materials in all pillars, inner fenders and floorpan. In an effort to further improve NVH characteristics, engineers also applied plastic and rubber bushings to the front sub-frame and increased the bushings size of the lower control arm. The 2017 Elantra is not only lighter than the outgoing model, but its rigid chassis is now reinforced with 53 percent advanced high-strength steel compared to 21 percent from the previous model, providing improved stiffness at a lower body weight. This increased utilization results in a 29.5 percent stiffer torsional rigidity and 25.3 percent greater bending strength, which bring improvements in vehicle ride and handling, quietness, durability and driving performance. Furthermore, the new Elantra increased structural adhesive application 40 times at higher stress points on the chassis and to reinforce welding areas. A component often found in aerospace applications, these structural adhesives also contribute to improved NVH and vehicle dynamics due to extra stiffness in the chassis. Hyundai engineers focused on these enhancements to develop a more rigid body structure in an effort to target top safety ratings by the IIHS and NHTSA. Improved ride comfort, handling and stability are achieved through Elantra's redesigned rear suspension geometry that modifies the angle of the rear shock absorbers and changed the position of the coil springs on the coupled torsion beam axle. Additionally, an increase in rear bushing diameter helps to improve long term durability. Elantra's front suspension uses an optimally designed McPherson strut with coil springs and gas shock absorbers along with a front stabilizer bar to help reduce body roll when cornering. The standard Motor-Driven Power Steering (MDPS) system instantly adjusts to changing driving conditions for greater precision and steering feel while improving fuel economy. Increased caster provides safe and reliable steering feedback at highway speeds. This 2.0-liter Nu four-cylinder engine is paired with either a standard six-speed manual transmission (available only on the SE trim) or Elantra's next generation six-speed automatic transmission. The new automatic transmission helps deliver dynamic performance with an overall 3.3 percent increase in efficiency for optimized fuel economy. A new valve body improves gear shift responsiveness and control, while an optimization in oil pump size aids in improving operating efficiency. A multi-clutch torque converter is also a new addition that allows more control over lock-up. Finally, rolling resistance and friction are minimized by adopting double angular ball bearings. Both engines feature a multitude of friction-reducing and cooling components and high efficiency engineering features designed to enhance fuel economy and maximize performance. In addition, all Elantra trims are equipped with the new Drive Mode Select feature that adjusts both powertrain performance and steering effort, allowing the driver to customize the driving character by selecting from three modes: Eco, Normal or Sport, simply by touching a button on the center console. In addition to the strengthened chassis, the 2017 Elantra makes structural improvements to the front side members that are now a hexagonal design and the dash-to-cowl connection has also been reinforced. The front apron to the A-pillar now features a straight and continuous load path and has hot stamping applied on the front side rear lower member. B-pillar assemblies feature partial softening hot stamping that start with a reinforcement section (150kgf grade) and then transition into a softening section (100kgf grade) to help absorb side impact. The rear doors also feature dual impact beams. A seven airbag system is standard, including a new driver's knee airbag, along with Electronic Stability Control, Vehicle Stability Management, Traction Control, ABS and a Tire Pressure Monitoring System. The 2017 Elantra is expected to receive an IIHS Top Safety Pick+ and NHTSA 5-star safety rating. New for 2017, the Elantra also offers a wide array of advanced safety technologies, often reserved for luxury cars, to provide another defensive safety layer for its passengers beyond the standard safety system. Available Automatic Emergency Braking with class-exclusive Pedestrian Detection is a technology that utilizes both the front forward facing radar and camera through sensor fusion to detect a vehicle or pedestrian, and warn the driver of a potential collision. If the driver does not react to avoid the impact, the system will apply emergency braking. 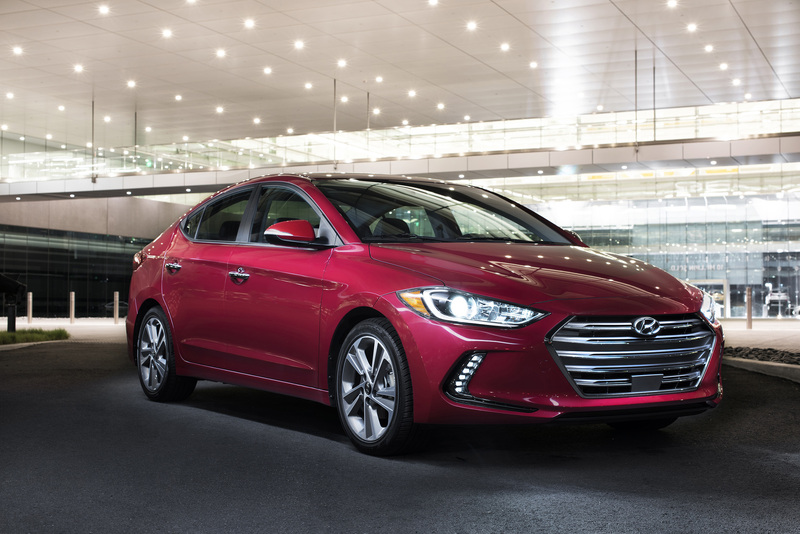 Additional Elantra-first safety technologies include available Lane Keep Assist, Blind Spot Detection with Rear Cross-Traffic Alert and Lane Change Assist, and a rearview camera, now with dynamic guidance. Lane Keep Assist uses a forward-facing camera to detect lane markings and will alert the driver if the vehicle drifts outside the lane without signaling. The system will apply corrective steering assistance if necessary, and is another active safety tool to assist Elantra drivers and help prevent accidents. The 2017 Elantra truly advances ahead of the compact car class with innovative technology that enhances driver confidence and convenience, without the premium price. Elantra's segment-exclusive hands-free Smart Trunk, allows Elantra drivers to conveniently open the trunk if their hands are full by simply approaching the rear of the vehicle with the key fob in a purse or pocket. An audible beep will sound three times, and the trunk will automatically open, making it easy to place items in the cargo area. The new Elantra enhances the driver experience with available all new Dynamic Bending Light and Smart Cruise Control technology. Dynamic Bending Light (DBL) works in tandem with the HID headlights, so they turn-in with the direction of the steering wheel for better nighttime visibility and safety, while the additional High Beam Assist feature automatically dims the high beams when approaching vehicles are detected. Elantra's Smart Cruise Control (SCC) makes highway and long distance driving more comfortable. Using a radar sensor mounted on the lower front grille, the SCC system maintains a set distance from the vehicle ahead in varied traffic conditions by automatically adjusting vehicle speed as needed. All Elantras come standard with iPhone®/USB and auxiliary input jacks and SiriusXM® satellite radio. New for 2017, the Elantra features two advanced infotainment systems beyond the base audio system that perfectly cater to the digitally connected – an available 7.0-inch Display Audio touchscreen system with rearview camera, and Hyundai's next-generation 8.0-inch navigation system. Both multimedia systems are equipped with Android Auto for seamless and intuitive operation of the most commonly used smartphone functions including app-based navigation, streaming audio, voice-controlled search capabilities, plus any approved smartphone apps. Since smartphone integration requires a wired connection to the vehicle, Elantra provides an available second USB port for charging – the first application on a Hyundai vehicle. The advanced 8.0-inch navigation system features an enhanced display with improved touch sensitivity for touch and drag control, increased screen brightness for better daytime visibility, and a split-screen display showing map and music data. Both SiriusXM Satellite Radio and HD Radio® Technology are standard on this system. For additional convenience and connectivity, navigation-equipped Elantras offer pre-loaded apps, voice control functions, and premium SiriusXM features. For the first time, Elantra also will offer an eight-speaker Infinity premium audio system, including a center speaker and subwoofer. Furthermore, music lovers will appreciate Hyundai's first application of Harman's patented Clari-Fi™ music restoration technology. Clari-Fi™ analyzes digital audio files during playback and automatically rebuilds much of what was lost in the compression process. This delivers a musical experience closer to the artists' original intent, with increased dynamic range for enhanced realism, and improved overall fidelity. The 2017 Elantra offers the next-generation Hyundai Blue Link system with enhanced safety, service and infotainment telematics. Blue Link brings seamless connectivity directly into the car with technology like Remote Start w/ Climate Control, Destination Search powered by Google®, Remote Door Lock/Unlock, Car Finder, Enhanced Roadside Assistance, and Stolen Vehicle Recovery. Blue Link can be easily accessed from the buttons on the rearview mirror, the web or via smartphone app. Some of these features can even be controlled via the latest Android Wear™ and new Apple Watch™ smartwatch offerings. Blue Link is offered in three service packages: Connected Care & Remote is available on all models and Guidance is available on Navigation-equipped models. 2017 Elantras equipped with Blue Link offer one year of complimentary Blue Link Connected Care.